While solid state and hybrid disks are starting to find their way into laptops and even some desktops, conventional hard disk storage continues to be the long-term storage method of choice for modern computers, from the mainframe to the desktop. In Windows Server 2008, you must first initialize this conventional hard disk storage and organize it into volumes, drives, and partitions before you can use it. RAID (redundant array of independent disks) is a term used to describe a technique that has gone from an esoteric high-end solution to a normal procedure on most servers. Fifteen years ago, RAID was mostly unheard of, although the original paper defining RAID was written in 1988. In the past, most server systems relied on expensive, higher-quality hard disks—backed up frequently. Backups are still crucial, but now you can use one form or another of RAID to provide substantial protection from hard disk failure. Moreover, this protection costs much less than those big server drives did. You can implement RAID at a software or hardware level. When implemented at the hardware level, the hardware vendor provides an interface to administer the arrays and the drivers to support the various operating systems it might need to work with. Processing for the RAID array is handled by a separate processor built into the RAID controller, offloading the work from the computer's CPU. Additionally, many hardware RAID controllers include a substantial dedicated RAM cache, often with a battery backup. The combination of a separate, dedicated processor and a separate, dedicated cache provides a substantial performance advantage over software RAID. Additionally, most server-class hardware RAID controllers offer additional RAID levels when compared to software RAID, providing redundancy advantages such as multiple disk failure protection. Hardware RAID is generally substantially more expensive than the software RAID built into Windows Server 2008, though many manufacturers today include basic hardware RAID capabilities on the motherboard. Windows Server 2008 includes an excellent and flexible implementation of RAID levels 0, 1, and 5 in software. It doesn't cover all the possibilities by any means, but it is certainly sufficient for some purposes. However, most serious servers should be using hardware RAID. 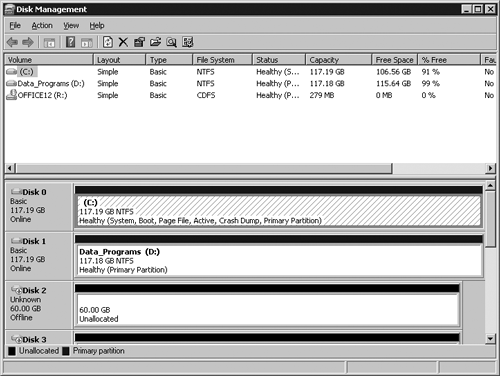 The primary GUI for managing disks in Windows Server 2008 is the Disk Management console, Diskmgmt.msc, shown in Figure 19-1, which can be run stand-alone or as part of Server Manager. The primary command-line tool for managing disks is DiskPart.exe. To open Disk Management, you can start it stand-alone by running Diskmgmt.msc from a command line, or by typing it into the Run dialog box on the Start menu. Disk Management is also part of the Server Manager console, in the Storage section, as shown in Figure 19-2. Although Disk Management provides an adequate software RAID solution, hardware RAID is widely available, from either the original server vendor or from third parties, and it provides substantial advantages over software RAID. Hardware RAID solutions range from a simple, motherboard-integrated RAID controller to fully integrated, stand-alone subsystems. Features and cost vary, but all claim to provide superior performance and reliability over a simple software RAID solution such as that included in Windows Server 2008. In general, they do, with the notable exception of some basic motherboard-integrated solutions offered on consumer-level motherboards for SATA drives. Even if circumstances force you to use what is an essentially desktop system, avoid using the built-in RAID on the motherboard, except as a simple SATA controller. Acceptable, uncached, stand-alone RAID controllers are reasonably priced and will provide far better performance and reliability. If your budget is so limited that even that is too much, use Windows Server 2008's built-in software RAID. Not all stand-alone hardware RAID systems provide all these features, but all have the potential to improve the overall reliability and performance of your hard disk subsystem. They belong on any server that isn't completely fungible. The Disk Management console in Windows Server 2008 lets you manage not only the local hard disks but also drives on other computers running any version of Windows 2000, Windows XP, Windows Server 2003, Windows Vista, or Windows Server 2008, allowing an administrator to manage disk tasks and space allocations from a workstation without having to sit at the computer that is being administered. This capability is a boon for remote site management and also simplifies management of Windows Server 2008 Core. For details on how to create custom management consoles that connect to remote computers, see Chapter 14, "Managing Daily Operations." 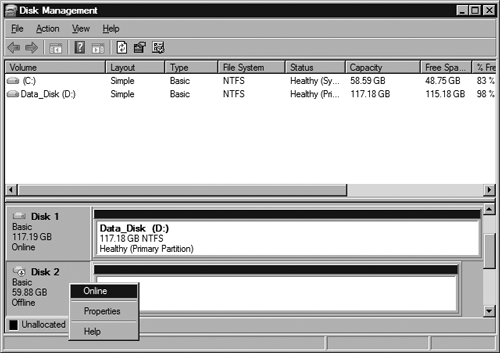 Dynamic disks were introduced in Windows 2000 Server. By converting a disk to a dynamic disk, you give Disk Management the ability to manage it in new ways, without requiring a reboot in most cases. You can extend a disk volume, span a volume across multiple physical disks, stripe the volume for improved performance, mirror it, or add it to a RAID-5 array—all from the Disk Management console and all without a reboot, after the disk is converted to a dynamic disk. When combined with the new remote management functionality, dynamic disks give the system administrator powerful tools for managing the type and configuration of hard disk storage across the enterprise. We used to be big fans of dynamic disks. They provided increased flexibility and functionality in a way that was pretty transparent. And they were a huge step forward when they were introduced in Windows 2000. At the time, RAID controllers were both more expensive and less functional, and many servers didn't have hardware RAID on them. That's simply not the case anymore. If using dynamic disks increases your options, isn't that a good thing? Well, yes. But. And it's a big but. A dynamic disk complicates the disaster recovery process, and we dislike anything that creates potential issues in a disaster recovery scenario. We definitely don't think dynamic disks are appropriate for a system disk. And we just have a hard time seeing where the upside is given the functionality that your RAID controller or SAN array management application provides. If you do find a need that can't be solved any other way, then by all means use dynamic disks. There's no apparent performance cost, and you use the same tools to manage both dynamic disks in Windows Server 2008 and basic disks. But avoid converting your system disk to dynamic. And make sure your disaster recovery procedures are updated appropriately. Windows Server 2008 includes a full command-line interface for disks. The primary command-line tool is DiskPart.exe. This command-line utility is scriptable or it can be used interactively. Additional functionality is available using Fsutil.exe and Mountvol.exe. As we go through the steps to manage disks in this chapter, we'll provide the equivalent command lines and a few basic scripts that you can use as the starting point for building your own command-line tools. The one task that doesn't appear to have a command-line solution is initializing a new disk. As far as we've been able to tell, you need to use Disk Management to initialize new disks before they can be used. Adding a new disk to a Windows Server 2008 server is straightforward. First, obviously, you need to physically install and connect the drive. If you have a hot-swappable backplane and array, you don't even have to shut the system down to accomplish this task. If you're using conventional drives, however, you need to shut down and power off the system. After you install the drive and power up the system again, Windows Server 2008 automatically recognizes the new hardware and makes it available. If the disk is a basic disk that is already partitioned and formatted, you can use it without initializing, but it will initially appear "offline" in Disk Management. If it's a brand-new disk that has never been partitioned or formatted, you need to initialize it first. And if it's a dynamic disk or disks, but from another computer, you need to import it before it's available. If the disk has never been used before, you're prompted by the Initialize And Convert Disk Wizard. Note If you're adding a drive to your server that uses a different technology than existing drives, or simply a different controller, it might require a new driver before the system recognizes the disk. 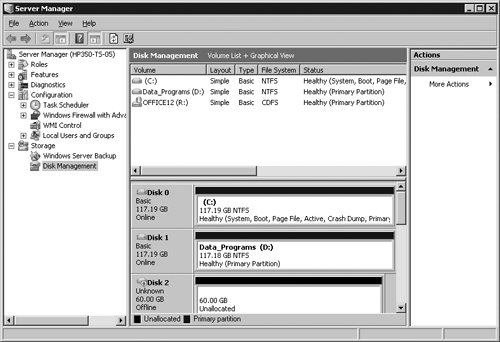 Right-click the disk you want to bring online, and select Online from the Action menu, as shown in Figure 9-3. The command-line equivalent is shown in Figure 19-4. When you install a brand-new disk that has never been formatted or used by Windows, you need to initialize it. It might initially be shown as offline. If so, you need to first set the disk online, and then initialize it. If the new disk is online, the Initialize Disk dialog box will automatically display when you start Disk Management, as shown in Figure 19-5. 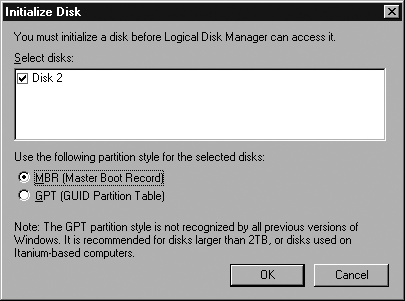 When you initialize the disk, you can choose whether to use Master Boot Record (MBR) or GUID Partition Table (GPT) as the partition style. For any disk larger than 2TB, GPT is recommended. We're still using MBR for all our disks, except for the one huge SAN volume we have, but we're leaning toward changing that for all new disks.